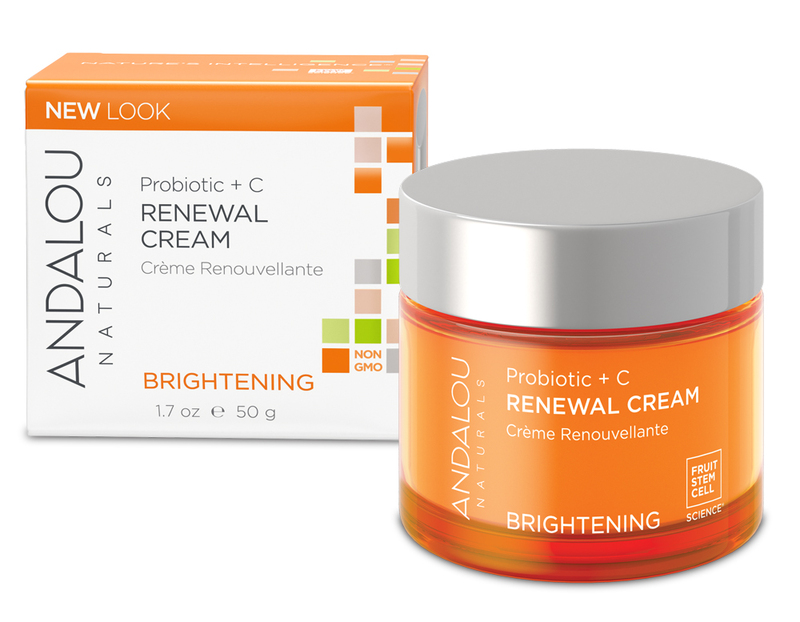 Andalou Probiotic + C Renewal Cream is a cream that targets over-exposed surface cells for a lighter, tighter, brighter looking appearance and a luminous complexion. It is formulated with a fruit stem cell complex, vitamin C, and skin-friendly probiotic microflora. For Normal/Combination Skin. Fruit stem cell complex, vitamin C, and skin-friendly probiotic microflora enzymatically support dermal vitality, targeting over-exposed surface cells for a lighter, tighter, brighter looking appearance and a luminous complexion. To Use: Daily. Apply to clean face and neck. A clear orange plastic jar with a silver twist-top lid. Comes with a plastic hygiene cap and packaged in a white box with the Brightening Skincare Collection orange branding (per Andalou). A 50g jar will set you back approximately $25 RRP unless purchased on sale. This renewal (day) cream is a part of the brightening skincare collection, which focusses on complexion defence and is infused with Vitamin C. I was the very lucky recipient of a prize pack from Andalou, where I won a number of their products from this collection. This is ideal for me, as I suffer from pigmentation and subsequent uneven skintone. I also am prone to scarring due to higher melanin content. Day creams can be really hit or miss for me due to my combination skin type, along with a tendency for my skin to change with the seasons. It also doesn’t help living in southeast Queensland, where we suffer from some pretty horrendous humidity come summer, so moisturiser can sometimes sweat right off, along with anything else we slap on our faces (like makeup). So, it was an absolute pleasure to not only win this moisturiser, but to discover it was a match to my skin type, that it absorbs well, caused no irritation, didn’t cause any conflict when applying makeup, and did everything it said it would. My skin really did brighten with continued use (I was also using this moisturiser in conjunction with a few other products but I was so in love with this moisturiser I repurchased it). With or without makeup, I felt this moisturiser gave my skin that little bit of a lift and luminosity. I was beyond words. In addition, I really loved the citrusy fragrance (smells like a Vitamin C chew from when I was a kid). Also very uplifting. This moisturiser was an absolute pleasure to use. I was devastated to reach the bottom of the jar. If you are scent-sensitive, you may not like the scent, otherwise the cream is lightweight and easily absorbed. I cannot get over how well it smoothed onto my skin. I didn’t find the scent to be overpowering (and I can be very particular about scents in products). I had no issues with regards to skin sensitivity either. If you use multiple steps in your skincare routine (i.e. toner / mist, serum, oil, moisturiser): ensure you have enough time between steps to allow for absorption. This moisturiser is deceptively high-powered. You will get quite a bit of punch from a small amount. You will need a spatula otherwise dip and use. A little goes a very long way, however it is tempting to go to town (exercise some restraint)! The Andalou website says this moisturiser is ideal for normal to combination skin, however I am combination to dry with pigmentation and I think this stuff is the business. I also think if you suffer from dry patches, or if you are more to the dry side of life you will enjoy this product. I am such a fan I have repurchased this moisturiser a few times. Seriously, this moisturiser is a happy place to be. I’ve been using this moisturiser for 3 weeks and can see a significant improve in my complexion. After childbirth, my skin becomes easily irritated and getting red (while I already have sensitive skin, this is now worse), dry and tight patches, uneven skin tone due to hormonal acne, etc you name it all. Reading some reviews that this moisturiser is very gentle while effectively brightening skin tone, I’ve decided to give it a try and this is the best decision ever! First impression, the jar looks and feel luxurious. Though I have to admit that jar is not an ideal packaging for a vitamin C product, and not as hygienic as a bottle with a pump. The product has a quite thick consistency with refreshing citrus smell. It will not sink immediately into skin, but require a bit of massaging, then when absorbed will leave skin feeling soft and comfortable. This is perfect for both day and night use and lovely under makeup. I only use a pea size amout for whole face. Several times I tried more than that and it makes my face feeling heavy and sweaty. So a little goes a super super long way. After 3 weeks, I can notice the red and dark pigment from old acne scar has faded significantly. I still got some whiteheads here and there but they dry out and disappear in a day, leaving no mark so I’m happy enough. Make sure to wear sunscreen when using any vitamin C product. Good for both day and night use. Good under makeup. July 2018 Beautorium - zesty citrus scent, great moisturizer! When I saw this pop up for purchase during Beautorium, I couldn’t put this in my cart fast enough! I’ve used Andalou Naturals skincare before and this is technically a repurchase for me. This says a lot about the product, as I normally would prefer to try new creams, but I enjoyed using this so much, it’s something I would buy again and again. The cream has a light, gel like texture, but its capacity to provide long lasting hydration is fantastic. A little goes a long way, so just a small pea-sized amount is sufficient. I really like the fresh citrus fragrance, it’s refreshing and smells natural and absorbs very readily. There is no sticky or greasy residue. I love how soft, smooth and bright my complexion looks after using it and because of the light texture, I can apply sunscreen immediately after it and provides the perfect base to apply my make up. I can highly recommend this cream for anyone wanting a light textured day cream, with an added boost of Vitamin C for a brighter complexion! Just a small dab goes a long way! I've only used this moisturizer for the past week or so , but it's seriously changed my skin. Its helped my dry, dehydrated skin turn soft, moisturized and hydrated. It's full of vitamin c which has helped brighten dull areas of my face. It sinks in well and doesn't leave me feeling oily or greasy. Its light enough to use during the day, and lasts well under makeup. It's very comparable to the Ole Henriksen Nuture Me cream, but it much more affordable. It even has that lovely orange sherbet scent!